Thinking about franchise opportunities in India? Well, We have a detailed information regarding different kinds of franchise business available in India. India is growing at a very fast pace in terms of economy. Parallel to that the franchise opportunities in India are increasing a way lot than ever. “The beauty of the franchise is that people buy a brand and a system. With a franchise, you pay a fraction of what it would cost to do it on your own”. Setting up a franchise business model is easy and effortless when compared to traditional business models, where you need to invest a lot of time and money in trial and errors. With the successful model in hand A franchise business helps in setting and running a business of your choice with all the efforts already taken by someone else beforehand and only the smooth way has been shown for you to explore. The franchise can be taken from different sectors of businesses. We have covered some of the high demand franchise categories in India. 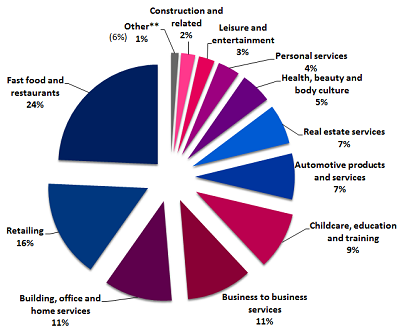 As per the above picture, the main share of franchisees is grabbed by Food and beverages. It has a total stake of 24% which shows that one in every four franchises in the whole world is related to Food. Food and Beverages franchises are very easy to replicate and run because of the highly organized manuals and recipe books. The stock will be provided by the franchisor and also the recipes and trained staff to take care of every need in day to day services. The risk of developing a business and putting effort to make it successful is very less because everything will be already borne by the franchisor and innovative methods to overcome those problems has already been found and listed in your operations manual. It is just so true. No one would have ever said no to iceccream. It is a very simple ann delicious food which can bring yur mood up. “I love dessert. All kinds. But there’s something about ice cream that makes me happy. I am drawn to its simplicity. I am perplexed by the endless supply of constantly growing flavor options. And I am always in the mood for sprinkles and a sugar cone”. 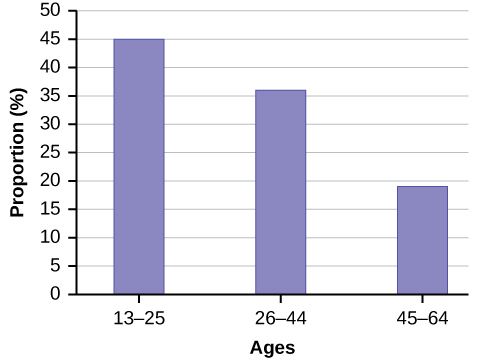 The total share of Icecreams is one third of all dessert lovers in the whole world. So, people who think of their sweet tooth will Icecream as their first choice to dwell upon. 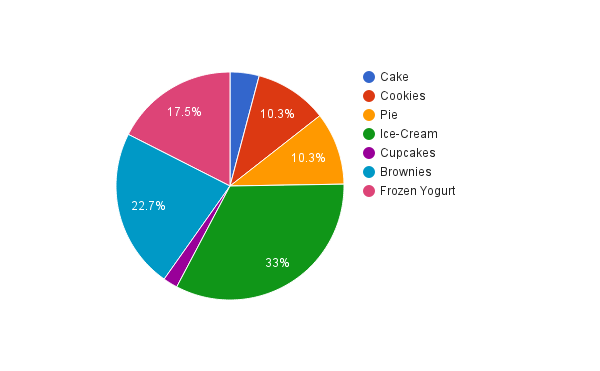 From the above bar graph it is clearly stated that the youth population is about 45 % which is the main category of people who are interested in Icecreams and desserts.With all the Icecream lovers flooded in this country. It is easy to get business form them. 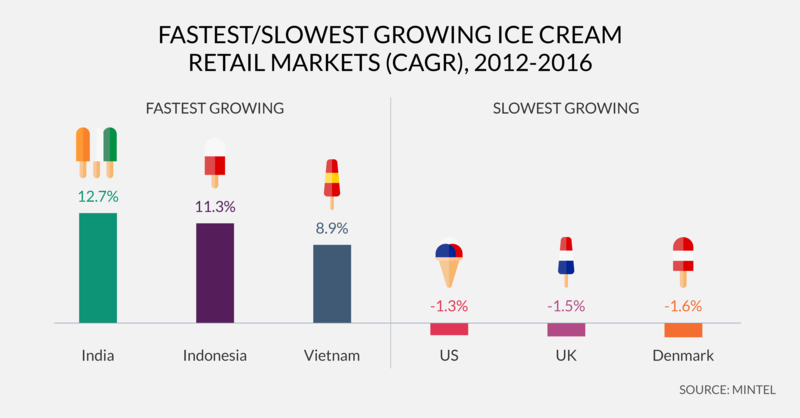 Keeping that in mind, Lets us have a look at how our country India is growing in terms of Icecream business.Have a look at the infographic below. Its shows India has the fastest growth in Icecream Industry compared to any other countries with 12.7% growth every year. It is wise to invest in Icecream Industry now to be ahead of everyone else who realize the worth of this sector later. Iceberg is in the business from the year 2015 with 12 successful and happy franchises in South India. It has been started as a single store in Bangalore. We have been serving the localities with our delicacies. Thought of giving a franchise in 2016, Our first franchise opened in Goa, Porvorium. Within a year the franchises grew into 10 only in Goa. 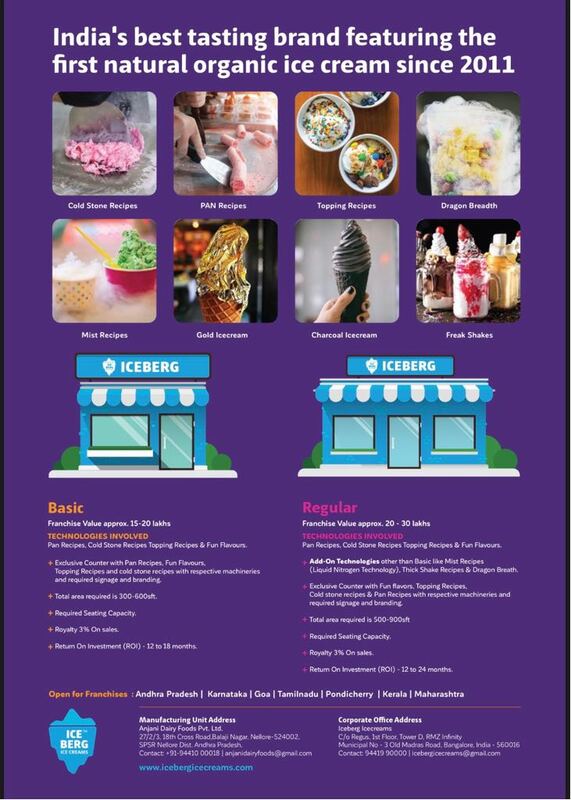 We have Iceberg franchise in goa at 10 premium locations. All of those are highly profitable and got their ROI in less than a year.